How can you make a carrot into fuel for a car? 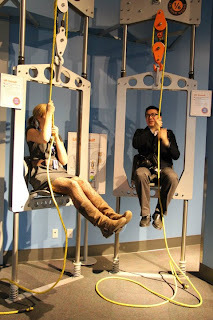 Visitors to Science World will soon have a chance to find out, thanks to a new partnership with Westport. Westport is providing support for a new exhibit called “Transportation Story” at Science World. Visitors will get a chance to view rarely-displayed Westport technology, and get to meet our scientists and researchers during interactive programs. On Saturday, December 17, members of the Westport team were onsite to lead interactive experiments, and teach fun facts like how garden vegetables can become natural gas. Investing in science education is important to Westport. As a leader in innovation and technology, we have a responsibility to foster curiosity and interest in science, particularly in Vancouver where we’re headquartered. Eureka Gallery exhibit on pulleys. Canada, like the rest of the world, is facing a huge energy challenge. The next generation will undoubtedly feel its effects. By encouraging kids to take a greater interest in science and technology, we hope to help build a home-grown pool of new thinkers and innovators in alternative energy. British Columbia is quickly gaining recognition for its growing technology sector, yet there’s a gap between the number of workers needed in the high-tech sector, and the number coming out of our universities. At Westport we hope that our team of engineers and scientists will show people that using science, one can make a meaningful contribution to society. Programming and exhibits like the ones at Science World give people a chance to think about how our actions and choices affect the world, including our transportation. Through education about renewable energy sources like natural gas, we have an opportunity to demonstrate how contributing to and adopting new discoveries and innovations can lead to a cleaner future.